Mark Hanna-the turn-of-the-century iron-and-coal-magnate-turned-operative who leveraged massive contributions from the robber barons-was famously quoted as saying: There are two things that are important in politics. The first is money, and I can't remember what the second one is.” To an extent that would have made Hanna blush, a series of developments capped by the Supreme Court's 2010 Citizens United decision effectively crowned a bunch of billionaires and their operatives the new kings of politics. 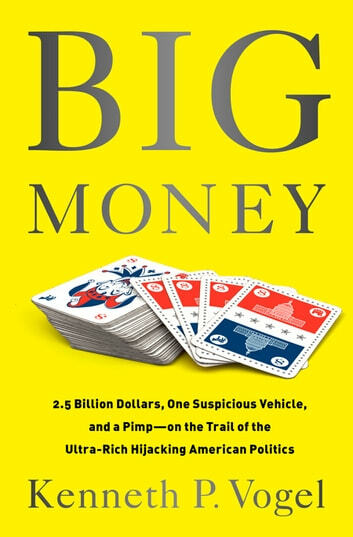 Big Money is a rollicking tour of a new political world dramatically reordered by ever-larger flows of cash. Ken Vogel has breezed into secret gatherings of big-spending Republicans and Democrats alike-from California poolsides to DC hotel bars-to brilliantly expose the way the mega-money men (and rather fewer women) are dominating the new political landscape. Great wealth seems to attach itself to outsize characters. 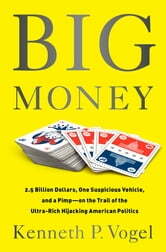 From the casino magnate Sheldon Adelson to the bubbling nouveau cowboy Foster Friess; from the Texas trial lawyer couple, Amber and Steve Mostyn, to the micromanaging Hollywood executive Jeffrey Katzenberg-the multimillionaires and billionaires are swaggering up to the tables for the hottest new game in politics. The prize is American democracy, and the players' checks keep getting bigger.